We’ve been stuck in a muffin rut at our house. The only kind Kate wants is Banana Chocolate Chip, but bananas don’t always agree with her belly so I needed to find a new muffin to entice her with. I was roasting up a pumpkin for another recipe and had some left over so I decided to give pumpkin zucchini muffins a try. 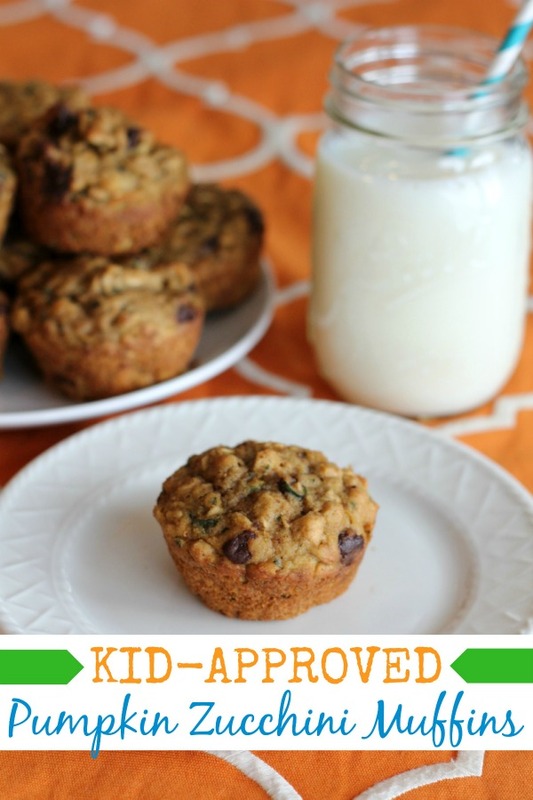 These muffins are delicious, filling, and the newest quick and easy breakfast or grab-and-go snack in our house! Preheat oven to 375 degrees F (190 degrees C). Grease muffin pan or line with paper liners. Combine oats, whole wheat flour, all-purpose flour, chocolate chips, baking powder, pumpkin pie spice, and baking soda in a bowl. Mix zucchini, pumpkin, almond milk, maple syrup, eggs, and applesauce in a separate bowl; stir into dry ingredients until just combined. Spoon batter into prepared muffin cups. Bake in preheated oven until a toothpick inserted into the center of a muffin comes out clean (about 20 minutes). 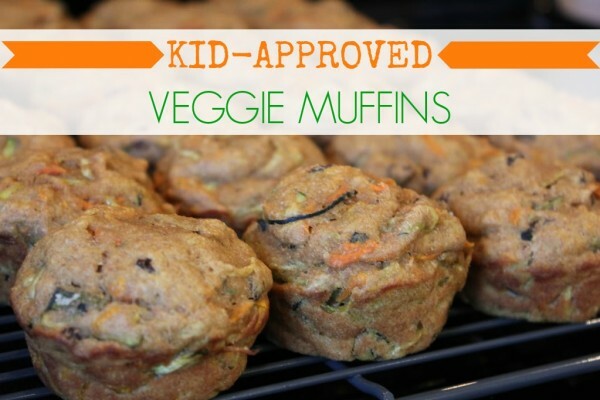 Kid-Approved Pumpkin Zucchini Muffins – they’re freezer-friendly, too! Bonus? 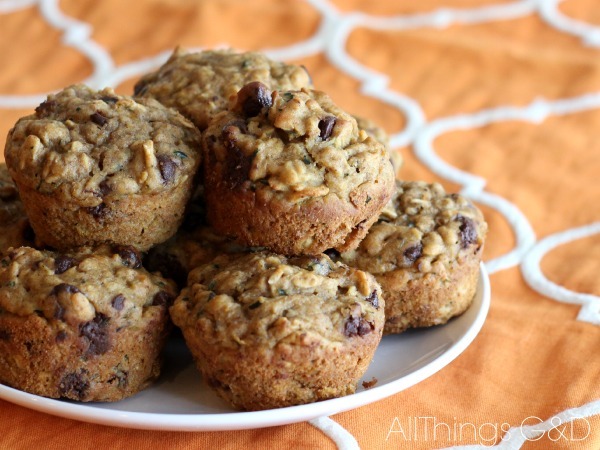 These muffins are freezer friendly! Make up a batch or two, pop them in the freezer and grab them as you need them. They thaw out at room temperature in about 30 minutes (or you can microwave them at low power 30-60 seconds if your belly is grumbling for some grub). What kind of applesauce do you use? These sound yummy. I use Santa Cruz organic applesauce – Kate loves it! Thank you, we are starting a new daycare in two weeks and they don’t provide breakfast so I’m going to need a few tricks for easy breakfasts. My pleasure, Anne! I hope your little one likes these! Did you use canned or fresh pumpkin? I am trying to use few canned products . . . I roast fresh pumpkins and puree them, but canned is also an option for people who prefer to go that route. Thanks for sharing this recipe, Dusty! One question – are you using maple syrup & agave nectar interchangeably? The recipe calls for maple syrup, but directions say agave nectar? I’m sorry Carla – that’s my mistake. The original recipe called for agave nectar, but I used maple syrup. I’ll edit my directions now. Thank you so much for the catch! I don’t see canola oil listed in the ingredients, just in the directions. How much do you use? Can’t wait to try these! I’m so sorry TW! I substituted applesauce for the canola oil in the original recipe so that’s what the directions should read. I’ll edit that now. Thank you so much for the catch! Could I use some brown sugar instead of maple syrup? If so, How much do you think? Wondering what I might have done wrong here. I got 27 muffins, even after filling them super full. And any bite that doesn’t have a chocolate chip has no flavor at all. Also they stick to the paper cups so badly that we loose half the muffin. I’m pretty good at following recipes so just wondering if you have thoughts on what I might have done. Added to much flour? Help!